Try adding a few beautiful, nonplant elements to your yard with these ideas for landscaping with rocks and stones. BHG: Many gardeners use stone and rock as interchangeable words, but the two are actually very different things. Can you explain? BP: Technically a stone has been exposed to weather or water near the Earth’s surface for a long period of time, while rocks come freshly broken from a larger mass below ground, most typically by blasting them out at a quarry. BHG: Is landscaping with rocks different than landscaping with stones? BP: Weathered stone has rounded or brittle edges and numerous crevices, so it will work best if you’re working in a moist, shady site where moss will grow. Similarly, lace lichen will grow on stone, but not on the smooth surfaces of cut or broken rock. Rocks and stones are great for retaining walls; find out how to build and maintain them. BHG: Obviously many gardeners already landscape with rocks and stones. Where do we typically see these materials? BP: Many people start the same way I did, by collecting stones they really like and using them as accents in high-visibility beds or even containers. Building a stacked-stone wall is also lots of fun, and you don’t need concrete if it’s less than 18 inches high. Behind the wall, you naturally create a new planting bed with wonderful drainage, and the wall itself makes a beautiful backdrop for vines and cascading flowers. Some types of stone make functional, eco-friendly pavers for pathways, but excellent site preparation is needed to keep the stones from shifting underfoot. If you have a water feature, stones are essential to create a natural setting and dramatize the water. Check out some stacked-stone wall ideas. Make your own DIY water feature. BHG: Are there any limits to the types of gardens that work well with rocks and stones? BP: There are unlimited possibilities, and the most sought-after stones come from old stone fences and stone cabins. 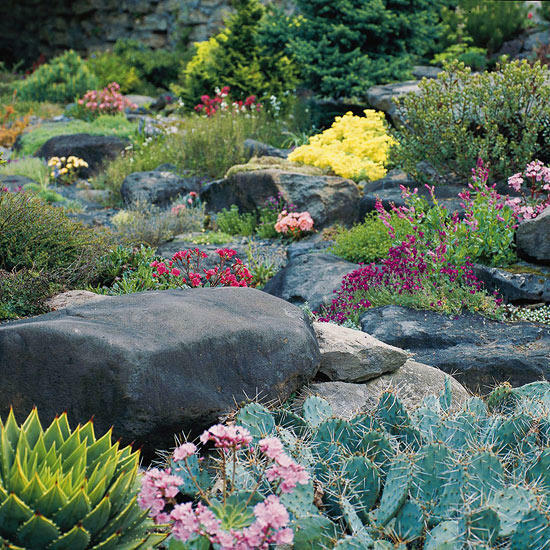 Simulating a stone “ruin” or tumbled-down building is a great plan for a rock garden, which is traditionally planted with alpine plants, thymes, and other plants that crave superior drainage. Get ideas for rock gardens. BHG: Many people have smaller yards and might think they don’t have room for landscaping with rocks and stones. What advice would you offer in a space-restricted yard? BP: Stonescapes need not be big. Planters and large containers that combine attractive stones with succulents are always stunning, and you can use specimen stones to reflect light from solar lanterns on your deck or patio. Don’t miss our small-space landscaping ideas. BHG: How do you approach gardening with rocks and stones? Do you start with a flowerbed and then accent with stones? Or work around a great sculptural piece of stone or rock that you want to use? BP: Stone can have a strong unifying influence on the landscape year-round, so it can be a powerful and practical element in any scene. Take time to envision what you want the spot to look like in two to three years, mindful that the stone will become visually dominant in winter. Ideally, you want to create scenes in which you can’t tell which came first, the garden or the stone. It should look and feel as if the stone emerged from the ground, and all you did was collect the best pieces and put them in order, as humans have been doing for thousands of years. BHG: So once gardeners have achieved function in landscaping with rocks and stones, how can they have fun? BP: I’ve been collecting photos of funky stonework for years, like using a standing limestone boulder as a mailbox holder, or building cairns to contain backyard fire pits. Gardeners should keep on hand a nice collection of landscaping stones that can be moved around according to tastes and whims. For example, when a flowerbed comes into its full glory, guild it with a temporary edging of stone. Gardens designed to attract butterflies might include small stone pillars situated on the east side to serve as early-morning basking spots. BHG: Even if you’re drawn to more eclectic pieces, what are some garden design rules of thumb when it comes to landscaping with rocks and stones? BP: In home landscapes, it’s generally best to choose one type of stone and stick with it for major projects rather than mixing up colors and textures. After all, you already have the textures from your house, deck, and other features. Adding one dominant stone texture looks natural, but several look junky. BHG: How can gardeners start to evaluate all the options for landscaping with rocks and stones? BP: Before making a choice, visit stone yards to see what is affordable, is readily available, and matches any stones or boulders already present in your yard. BHG: Building a wall, or a partial wall, is a popular project. What type of rock or stone should a gardener choose for this? BP: Find a stone that is available as “faced” stone, which has two flattish edges. Limestone, sandstone, and other sedimentary-type rocks (which originated at the bottom of lakes and seas) naturally break into faced pieces, which are easy and fun to work with in landscaping projects. Learn more about retaining walls. BHG: Is landscaping with rocks and stones sort of a leave-it-and-go solution? BP: It depends on your site. In a moist spot, freezing and thawing cause stones to shift, so a certain amount of fine-tuning is needed to keep stone walkways and walls shipshape. Crevices in stone walkways must usually be weeded, which I do by dousing them with boiling water from a teapot. On the other hand, clusters of well-placed stones in a fern garden need no upkeep at all, and rock gardens often need less weeding compared to fertile garden beds.